enhanced by the artistry of a noted landscape architect. It is both unique and idyllic in its compass of suburban summer camp life. Its name is Sodus Bay Heights. Its location is on the south shore of Sodus Bay, within easy motoring distance of Rochester, Syracuse, Newark, Lyons, and other places. In extent it covers 73 acres of rising ground. In beauty of vision it is unsurpassed anywhere in Western New York. count and it has remained within that noble family until the present time. Only a few years ago, the Countess Bon Hemert, successor of the original grantee, died in France. During her life she refused to sell it. Upon her death the heirs agreed to dispose of it. This is how it becomes now available as a suburban home site. Its pioneer patriotism is bound up in the annals of the War of 1812 with England. On the knoll of ground in the center of the tract, American patriots stood watching the British fleet shell and sack the little town of Troupville, by which Sodus Point was known in 1813. Situated on the south shore of Great Sodus Bay, named “Assorodus” (Silvery Waters) by the Seneca Indians, Sodus Bay Heights is a gently sloping acreage, which at its apex is 126 feet above the water level, with an undulating roll from boundary to boundary, and commands a wonderful view of the 40 miles of jutting and peninsular shore and a sweeping vista of the waters of Lake Onario. 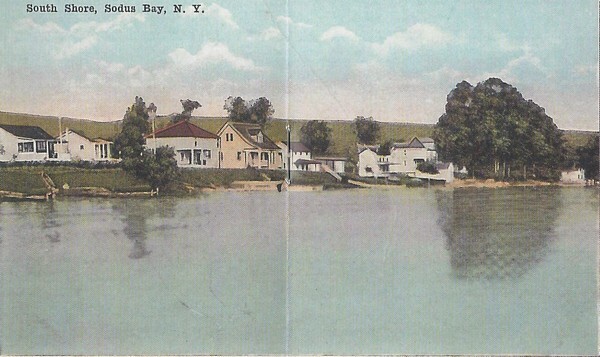 ……….. Postcard of the South Shore of Sodus Bay, early 1900s. 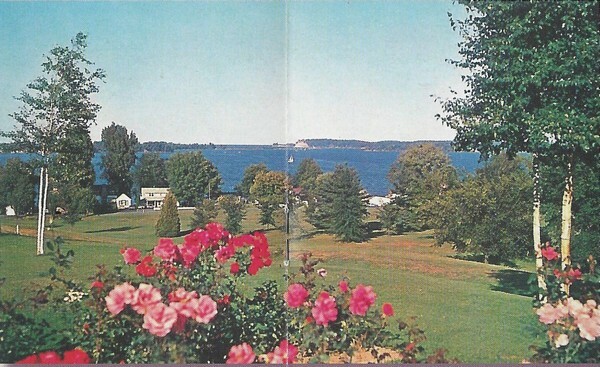 Published by W.C. Draper, Sodus Point, N.Y.
……….. Postcard of Lake Bluff from Sodus Bay heights. Published by Wm. Jubb Co., Inc., Syracuse N.Y.
Williamson, N. Y.; secretary-manager, John J. Leary, retired manufacturer of Sodus Point, N. Y. All of these have splendid summer homes adjoining the tract. So the area we now know as Sodus Bay Heights was sold in 1924. The Sodus Bay Golf Club was created and many tracts were sold to individuals who enjoy the incredibly beautiful panoramic view overlooking Sodus Bay. By the late 1920s, houses were being built on the Heights. 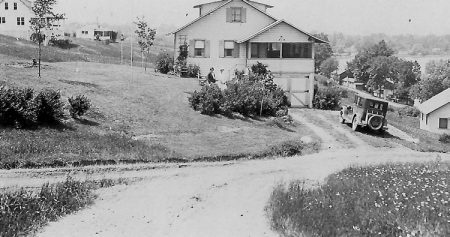 Pictured below is a 1926 photo of a new house on Central Ave. It currently is owned by Vince and Jody Myerly and used with their permission.